When new in 1904,Sea View Hall at 4004 Chilberg Ave. S.W. was a relatively isolated family cabin. Now the hall seems hunkered in its crowded beachside community. The address has also changed: In the streamlining 1950s, the 4000 block of Chilberg Ave. was renamed an extension of 59th Avenue – and thereby another link to history amputated. Andrew Chilberg and his extended family were leaders of Seattle’s Scandinavian community in the 19th Century. As the president of the Scandinavian National Bank, his vice president was Amund Amunds, a maternal uncle to Ivar Haglund’s mother Daisy. It was from Amunds that Chilberg got his part of Alki Point for development. Sea View Hall is one of the three log-cabin survivor in the Alki Point neighborhood. (The others are the Log Cabin Museum and the Homestead Restaurant. Recently – in 2010 – John Kelly, West Seattle explorer, revealed to me that he or his had found another, although one somewhat obscures by its size and landscaping. Perhaps, I learn again the address from John, which was a thrill – a modest one – finding on Google Earth.) Like the better known still now long-gone Stockade Hotel, his hall was constructed in good part of wood salvaged from the beach, its logs set vertically like a fort. And “Sea View Hall” was eventually spelled out in “logoglyph” style; letters shaped with big sticks and hung from the roof, or here the upper veranda. In this early view, the sign has not yet been shaped or placed. John and Ella Maurer are probably among the at least 23 persons posing here. In 1954, the hall’s 50th anniversary, John was identified as its builder by his daughter-in-law. 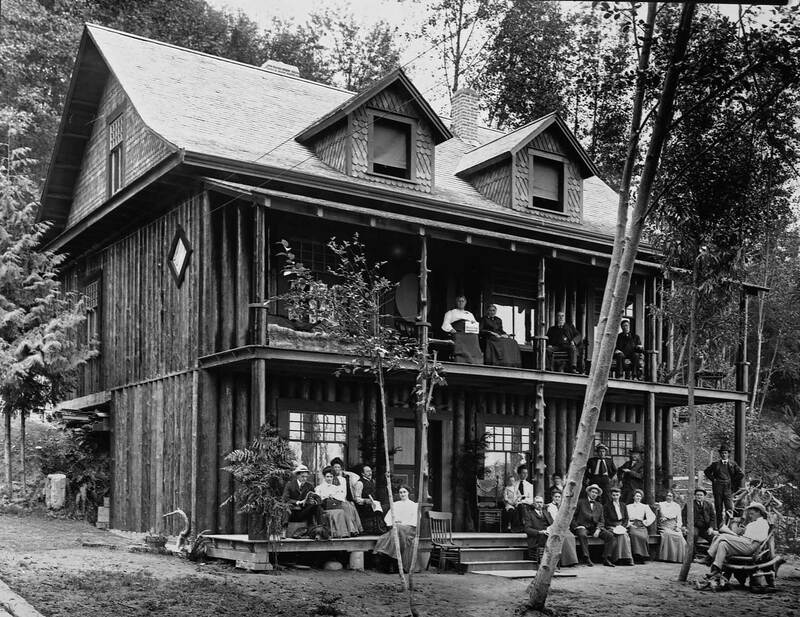 After returning from the Alaska Gold Rush, he had taken up construction and painting, and built this nostalgic summer cabin for his family’s recreational retreat from Seattle. The rustic theme was continued inside with, for instance, a staircase handrail constructed form a peeled log with banister supports fashioned from the same log’s twisted branches. My wife and I found this place when it was listed for sale around ’05. Sadly beyond our means, I have generally secretly wished it wasn’t. Good to know the tale. After years of neglect following the market downfall in 2008, the house has been lovingly restored and is now available as a VRBO. I purchased Seaview Hall in 2005. It was in a near tear down state. I spent 19 months renovating the home. From exterior log renovation, replacement, foundation and structural. The house had to have all new foundation and shear wall strengthening. Extensive salvage work on doors, windows, hardware and light fixtures was undertaken. Where restoration could not be managed, exact duplicates were made. 100 year old never been finished fir floors were brought back to life along with total new interiors 4 bedroom ensuite bathrooms created. Fireplaces were restored with river rock. New interior walls were treated with coating with crushed walnut shells to replicate lath and plaster walls. Original trim and wood was salvaged and reused throughout the house. New hydronic in floor heat was created on the main floor concrete flooring and new radiators were used elsewhere. Modern amenities created to feel historic such as subway tiles, marble and butcher clock counters and spa bathrooms. A falling down cobblestone room made from rocks collected from the beach was retro fitted with concrete reinforcements from the interior walls and garage doors from salvaged wood and copper gutters are some of the many elements of the extensive design taken. The house went into foreclosure and was bought a few years ago. Some remodeling and landscaping has been done recently and it was turned into a VRBO rental.